Continuous Cord Loop (5) ? If you like entertaining outside or just spending time on your porch, exterior solar window shades are the perfect fit. They will keep your outdoor space comfortable all year long. Plus, they block harmful UV rays, so you can be sure you keep your family safe and protected. 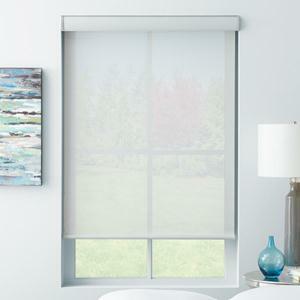 Outdoor patio blinds even help reduce glare, so you can have a good time without worrying about the glare on your outdoor TV, your laptop, or your phone. And these outdoor screens diffuse the sunlight that would otherwise be shining in your eyes sometimes. 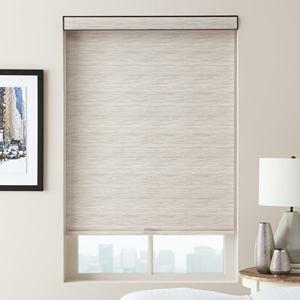 These outdoor shades are made from high quality sun control fabrics, and they come standard with waterproof and weatherproof components and mechanisms. 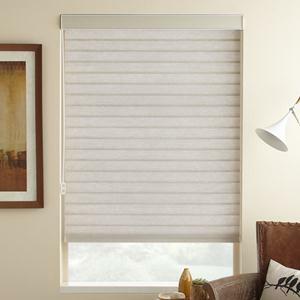 You can be sure that these exterior sun shades from Select Blinds are durable and will last for a long time. Plus, with the designer colors, you can have the look you want, all while staying within budget. When choosing exterior patio shades, you’ll want to be aware of the different openness levels. They range from 1% to 14%. The larger the number, the larger amount of light that will come through. Larger numbers also mean that you can still see through the shade, letting you keep your view. If you choose a smaller number, less light will be allowed to pass through the shade, and you won’t be able to see through the shade as much. As with all our blinds and shades, the exterior patio sun shades come available with a cordless lift system. After all, shouldn’t your patio be just as stylish, safe, and beautiful as the window coverings in your home?